I apologize for the quality of the pictures - we do not show, so do not clip our girls. They also aren't trained to be set up, so we aren't able to capture them at their best. Feel free to contact us about meeting them in person. As we develop our herd, we are moving toward all registered does. Several of our foundation does will be available after Appraisal in 2019. Please let us know if there is a doe that you are interested in. We will continue to breed some Experimental does, as we really enjoy these crosses. 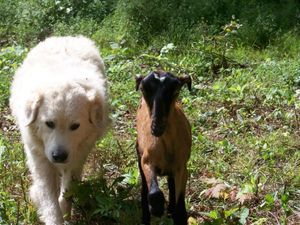 Dandelion is on the right, and Daphne is on the left in this photo - a couple of our first dairy goats. 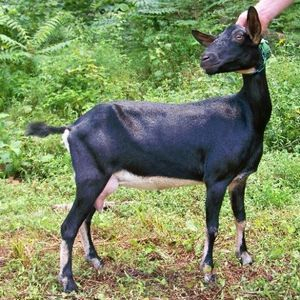 Becky comes from a LaMancha background – she is 37.5% Nubian / 50% Alpine / 12.5% LaMancha. She is recorded as Native-on-Appearance. She has grown into a stunning doe. She is long, level, and deep-bodied on strong feet and legs. Her personality is ideal for a dairy situation. We have 2 daughters and 2 grandaughters in our herd. All of our "R" line recorded grade does go back to her. 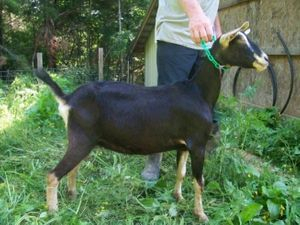 Becky will be bred to Distiller for February kids. Just a Minute was given her name after she was born 5 hours after her two littermate sisters. Last, but certainly not least! Minute is definitely at the top of the 2014 kids – wide, deep, and level she combines the best of her sire and dam. She easily earned her *M designation as a 2-year-old, and had the highest production of all of our 3-year-olds in 2017. 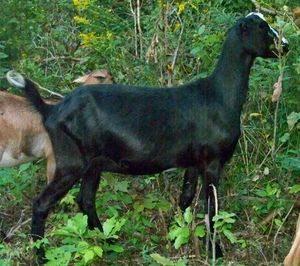 She has become our best and most patient demonstration doe, a great testament to the temperament her sire, Tacoma, stamps on his daughters. Minute will be bred to Red this fall for March kids. Kids will be 75% Nubian / 25% Alpine Experimental. Another of our Tacoma daughters, and 1 of 2 Judda daughters we have retained in our herd. Chant seems to favor her Alpine genetics in looks. She earned her *M designation as a 2-year-old. She was our highest-producing 2-year-old in 2016, milking 361 days. She is currently on another extended lactation. Chant will be bred to Dobby for June kids. 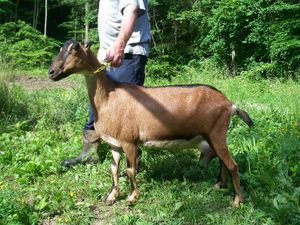 Kids will be Experimental (75% Alpine / 25% Nubian). Rainbow is owned by Sandra Cushman, but resides in our herd. She will be bred to Hoo this fall for April kids. 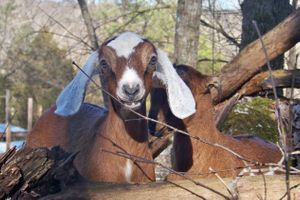 Rosie is owned by Sandra Cushman, but resides in our herd. More info coming soon!